“If we don’t get a trade deal ... and China winds up in a hard landing, you can rest assured that the global market will follow as well,” said one economist. 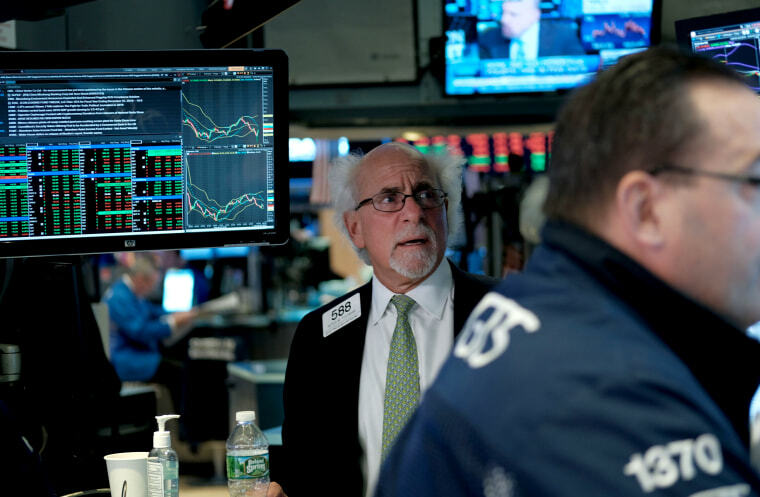 A key metric that historically has been a precursor to a recession emerged on Friday, reinforcing fears on Wall Street — although some experts think a recession could still be a year or more out. The yield curve inverts when the borrowing cost on short-term debt rises above the cost for long-term debt — an indication that investors expect lower growth in the future. All seven of the past recessions have been preceded by inversions of the yield curve. “It’s a dangerous and upsetting harbinger of the future of the economy,” said Dan North, chief economist at Euler Hermes North America. “Typically, when the yield curve inverts for even a short period of time, we enter a recession about a year later,” he said. The time frame varies, he added; it has taken anywhere from two to six quarters after an inversion for a recession to occur. That question of when is a critical one — and even the experts have different views. “I do think when investors see the word inversion, their minds tend to link that to recession, policy error and things of that sort,” said Jim Barnes, director of fixed income at Bryn Mawr Trust, but he characterized the current inversion as modest in the context of the broader economy. “It may not necessarily mean total negative growth, but it could mean a real slowdown,” said Peter Cardillo, chief market economist at Spartan Capital Securities. “That’s what the market is really spooked about,” he said. Some experts suggested that the prolonged period of low interest rates, an environment that has been a hallmark of the post-recession economy, could be skewing the data in unprecedented and unpredictable ways. “It is one of the best indicators of recession, but it’s still a terrible indicator in the sense that it has preceded all recessions, but sometimes you have an inverted yield curve and you don’t have a recession,” said James Berman, founder and president of JBGlobal LLC and an adjunct instructor in finance at NYU School of Professional Studies. “The biggest issue I think for the market when yields drop as low as they have is on the income appetite of investors, primary institutional investors,” said Andrew Thrasher, portfolio manager for Financial Enhancement Group and founder of Thrasher Analytics. Low yields prompt investors to seek out income from other, riskier assets — which makes them vulnerable to volatility and sharp drops in the market. A series of interest rate increases by the Federal Reserve over the past few years means that monetary policymakers in the U.S. have more flexibility than their counterparts overseas in that they have more room to cut rates if economic conditions warrant it. “That’s a luxury other developed markets don’t have,” Barnes said. But even with this advantage, Barnes warned that the global nature of economic activity today means that contagion is a real risk. “The concern is that some of that weakness overseas could spill over into the U.S.,” he said. With the benchmark federal funds rate at just 2.5 percent, even the relative flexibility the Fed has is limited. Ongoing geopolitical turmoil — from President Donald Trump’s trade war to the still-unresolved Brexit crisis — remains a key threat to economic growth, both in real terms as well as the negative impact they have on consumer confidence and spending. “I don’t think we’re headed for negative growth right now, but if we don’t get a trade deal — if this trade war is not stopped and they don’t lift the tariffs in China — they could be headed for a hard landing, and if China winds up in a hard landing, you can rest assured that the global market will follow as well,” Cardillo said. North said another indicator he is watching is the Conference Board’s survey of consumer current and future confidence in the economy. “That split is very wide to the negative,” he said, a sign that Americans are expecting conditions to worsen. If this sentiment is reinforced by a weakening labor market, a crisis of confidence could create a negative feedback loop that drags down economic growth. As such, economic experts are going to be especially keen to find out if February’s anemic job growth was an anomaly, or a sign of things to come. “If we start to see [unemployment] back up, that would be another affirmation of future weakening,” North said.